For the health, safety and privacy of our family, cats and kittens, we no longer offer visits to our home. ​We don't provide information about kittens until they're posted, after 7 weeks old or when we feel they are ready for adoption. Kittens will be released to go home at 10-14 weeks of age or when we feel they are ready. The "go home" date will be indicated when they are posted on the "Available" page for reserve. When a litter is available, you can reserve online by clicking the ">>available<<" link above, review the pictures of our kittens and click the "Buy Now" button below the kitten of your choice. 1. Age appropriate distemper vaccine (Usually the 1st vaccine if kitten goes home at 10 weeks). 3. Vet record to give to your vet. 9. Written instructions of "Transitioning your new pet to your home"
10. A kitten kit that includes a small toy and sample of food. We accept deposits on kittens that are posted to the "available" page of our website and don't take advance deposits on unborn litters or kittens not posted to our website. Please note; your deposit is non-transferrable and non-refundable after choosing and placing a deposit on a kitten, so choose carefully before making a deposit. Credit / Debit card fee info: When placing a deposit on a kitten online using your credit or debit card, no processing fee will be charged. We do not accept echecks. 2) If delivering by air courier ~ Must be paid by PayPal link that will be provided within 7 days of scheduled delivery date. IF FINAL PAYMENT FOR KITTEN ISN'T RECEIVED WITHIN 7 DAYS, YOUR DEPOSIT WILL BE FORFEITED AND YOUR KITTEN WILL BE IMMEDIATELY PLACED BACK UP FOR SALE. 1) Delivery by car is free of charge. Please read our "delivery" page. 2) If delivering by air courier ~ Payment for delivery is to be paid using a PayPal link provided within 7 days of scheduled delivery. IF DELIVERY PAYMENT FOR KITTEN ISN'T RECEIVED WITHIN 7 DAYS, YOUR DEPOSIT WILL BE FORFEITED AND YOUR KITTEN WILL BE IMMEDIATELY PLACED BACK UP FOR SALE. PLEASE NOTE: WITH THE ACCEPTION OF AIR DELIVERY, CREDIT CARDS ARE NO LONGER TAKEN FOR FINAL PAYMENT or DELIVERY! Step 1) Once a deposit is made, as soon as we are able, your kitten will be listed on the “available” page of our website as “reserved for you”. If you have successfully placed a deposit and received a receipt for your deposit from PayPal, that is your immediate proof the kitten is reserved for you. Should someone else try to place a deposit on your kitten, they will receive a message "your item sold out." This means the kitten has been reserved for you and they will not be able to process the transaction. Therefore, no one else will be able to reserve your kitten after you've placed a deposit. After your deposit is received, we'll be in touch with you by email the next weekend after deposit has been received to provide information about the care of your kitten and provide delivery date, time and location. 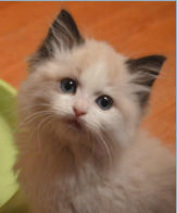 IF YOU DO NOT CONTACT US TO CONFIRM DELIVERY WITHIN 5 DAYS AFTER THE INFORMATIONAL EMAIL IS SENT, KITTEN WILL BE REPOSTED FOR SALE AND DEPOSIT WILL BE FORFEITED. Step 2) Adoption Confirmation & Begin Delivery Arrangements. The next weekend after placing your deposit, you’ll be contacted personally by email to confirm your deposit has been received and applied to the kitten you chose. In this email we’ll also begin delivery arrangements. In general, we schedule delivery of the kitten no less than 10 weeks of age. At the discretion of the breeder, we may opt to hold a kitten longer. We will also provide in this email the following; A copy of our health contract, written instructions of what to (and how) to feed your kitten, written instructions of "Vet Treatment For Ragdolls" that lists vacinnes due, date due, written instructions of "Transitioning your new pet to your home" and we'll also let you know what type of litter we use. Health contract is also available to read in advance by clicking here >>> Health Contract /// IF YOU DO NOT CONTACT US TO CONFIRM DELIVERY WITHIN 5 DAYS AFTER THE INFORMATIONAL EMAIL IS SENT, KITTEN WILL BE REPOSTED FOR SALE AND DEPOSIT WILL BE FORFEITED. We are always acting proactively by seeking and accepting the advice and experience of veterinarians and seasoned breeders on ways to improve the treatment protocol and care of our kittens. ﻿ All of our Mom's and Dad's are HCM -/- either through testing by UC Davis or by parentage. We are a FeLV/FIV negative cattery. Spay and neuter is not included in the price of the kitten. 1) From birth, your kittens health is monitored 24/7. 2) At days 3,5 & 7 , they each receive a dose of benebac plus which helps to promote ultimate GI health. 3) Age 28 days, they are given a form of Baycox that will work to prevent Coccidia in the kittens. 4) Finally at age 6 weeks, to round out your kittens treatment, your kitten will receive a 3 day treatment of Febendazole for the prevention of Giardia. 5) At approximately age 8 weeks, your kitten will be seen by our vet to receive a health exam and his/her first FVRCP vaccination.